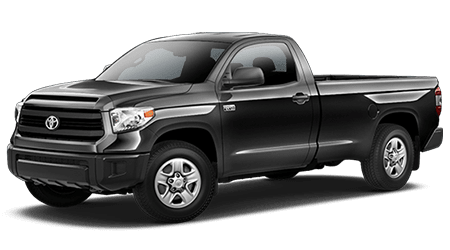 There are many good reasons to buy a 2016 Toyota Tundra full-size pickup truck - its imposing size, luxurious ride and tough-as-nails construction, for example - but there is only reason to take the new Tundra for an invigorating test drive. The Tundra is built in San Antonio, TX, and is the only full-size pickup currently made in Texas. For that reason alone, you should rush down to Venice Toyota immediately to test drive the only heavy-duty truck built in Texas by Texans. You will not be disappointed - the 2016 Toyota Tundra delivers! When you need a Toyota Tundra to do the job, no other pick-up truck measures up. Here at Venice Toyota, there is always a crowd around the new Tundra - in the showroom, on the lot and especially when it goes up in the service bay. Everything about the Toyota Tundra is heavyweight, and we are anxious to show you the finest that Texas has to offer. Venice Toyota is proud to feature the 2016 Tundra as a cornerstone of the Toyota lineup. If you live in Sarasota, Bradenton, Venice, North Port, and Port Charlotte, come down to 900 US HWY 41 Bypass S in Venice, FL for a first-hand look at this Texas-tough truck. When you sink into the comfy Euro-styled seats, surrounded by soft-touch contours and fine stitching, you will quickly forget you are riding in a truck. With separate climate controls for driver and front passenger, the lap of luxury has never felt so good. When you sit behind the wheel of the commanding new Tundra, the ergonomic dashboard and large touchscreen control panel will make you feel like a high-tech pilot. Gone is the tired old center console between the driver and front passenger, now replaced with a futuristic center stack that puts everything at your fingertips. Best of all, the rugged Tundra can take a beating and still clean up nicely for a ritzy night on the town. The iconic Toyota Tundra is basically a limousine with a five-foot bed in the rear. The Toyota Tundra Tows Tons! The all-powerful 2016 Toyota Tundra can tow up to 10,000 pounds without straining, thanks to the fearless iForce V8 engine and a powerful TOW/HAUL mode. That is more torque than you find in most dually trucks, and it's much easier to handle. Toyota has elevated towing to a science with the industry's first Integrated Trailer Brake Control to keep the trailer on the straight and narrow, and this feature is a blessing when towing a load in bad weather. You can count on the 5.7L V8 to leave lesser trucks in the dust, and to give you the extra boost you need to merge uphill into high-speed traffic while carrying a heavy payload. The reason the new Tundra can tow like a commercial tow-truck is its reinforced C-channel frame, normally only found on construction-grade vehicles. The indestructible trailer hitch fastens directly to the C-frame with 12 bolts. Do not mess with Tundra! You owe it to yourself to check out the awesome new Toyota Tundra, if only to experience how solid a Texas-built pickup feels, and how well it performs under any conditions. Years ago, when someone said your car handled like a truck, it was an insult. Nowadays, if your car handles like a 2016 Toyota Tundra, you should thank your lucky stars! Calling all drivers from Sarasota, Bradenton, Venice, North Port, and Port Charlotte: The new Toyota Tundra has arrived at Venice Toyota, including the spectacular off-road TRD Pro special edition which has to be seen to be appreciated. Drop by 900 US HWY 41 Bypass S in Venice, FL, for a test drive of the tenacious Tundra. But don't kick the tires on the new Tundra - they might kick you back!